GAL Sync « Jorge's Quest For Knowledge! The GAL Sync MA is pre-configured for about 90% and the remaining 10% needs to be provided by you, which is environment specific information. Think about AD domains, OUs, SMTP suffixes, etc. 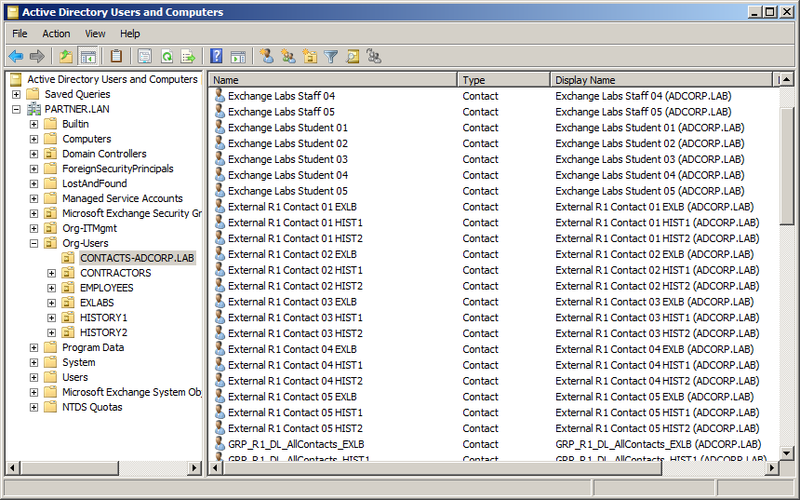 Another nice part about it is that it also includes code (Rules Extension DLL) to use within the GAL Sync MA and for provisioning. The Rules Extension DLL is available in the folder "C:\Program Files\Microsoft Forefront Identity Manager\2010\Synchronization Service\Extensions" and is called "GALsync.dll". As soon as you configure at least one GAL Sync MA, the GAL Sync Rules Extension DLL will be configured automatically in both the metaverse and the GAL Sync MA. Now imagine you want to change how synchronized objects are displayed in the AD forest. In other words, you want to change the Display Name of synchronized objects in the target AD forests only to include the company name of the source AD forest. This is just a example. 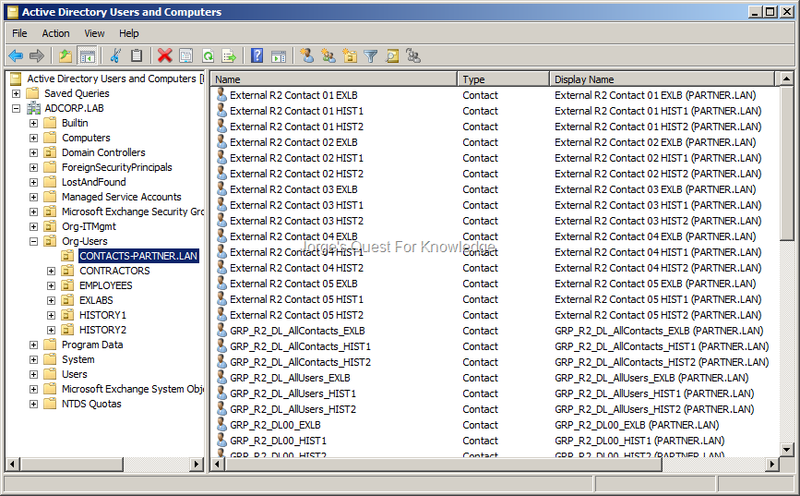 Besides Microsoft providing a pre-baked Rules Extension DLL, Microsoft also provides the source code to that Rules Extension DLL! The source code can be found in the folder "C:\Program Files\Microsoft Forefront Identity Manager\2010\Synchronization Service\SourceCode\GalSync". My suggestion here is that if you want to recompile your own Rules Extension DLL, and therefore change the source code, you create a copy of the GalSync folder to another location on the server with the FIM Sync Engine. 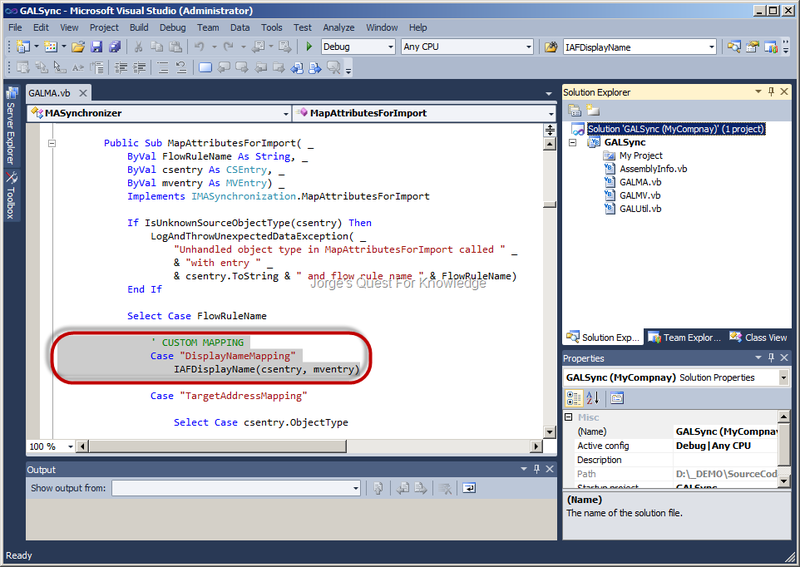 Be aware thought that to enough the source code, you need to use something like or similar to Visual Studio. When creating a copy of the GalSync folder, make sure to include the name of your company in the folder so that it is clear that it is custom code, e.g. GalSync_MyCompany. Of course you need to rename MyCompany to the actual name of your company. 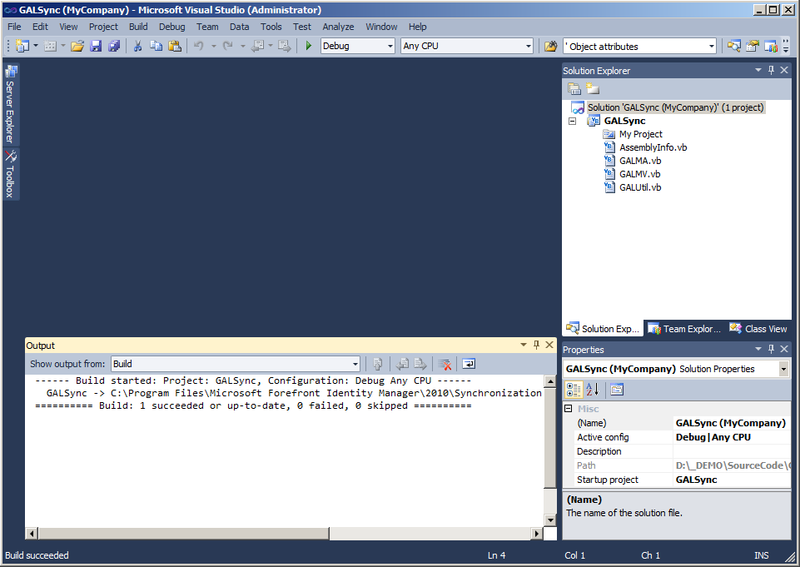 Assuming you already have Visual Studio installed, the first thing to do is to double-click on the file "<Path>\GalSync_MyCompany\GALSync.sln". Visual Studio will start and the conversion wizard will most likely start. Accept the defaults and in the end view the conversion log. 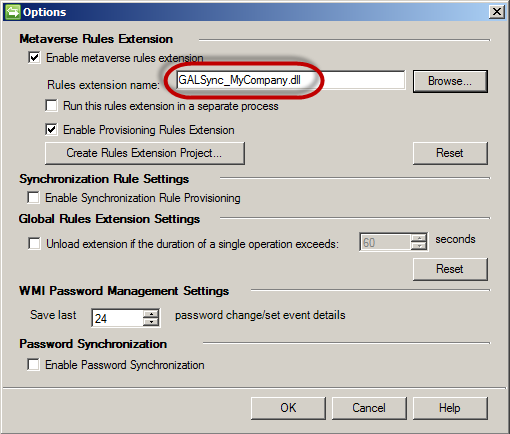 Next thing to do is to rename the name of the solution from the default "GALSync" to "GALSync (MyCompany)". This makes it clear it is not the default source code, but rather customized. 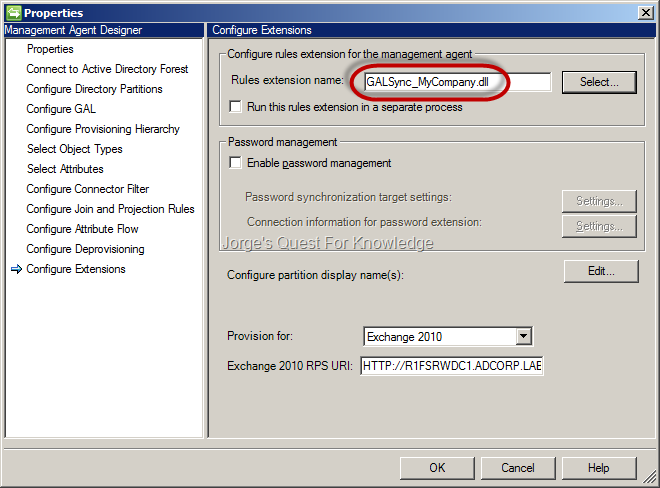 In the solution explorer right-click "Solution ‘GALSync’ (1 project)" and select rename and enter the new name name being "GALSync (MyCompany)"
Next thing to do is to rename the name of the compiled assembly from the default "GALSync" to "GALSync_MyCompany". This makes sure that if Microsoft implements a new(er) version of the GALSync Rules Extension DLL in some service pack or hotfix, it will not break your GAL Sync solution. In the solution explorer right-click the project called "GALSync" and select properties. 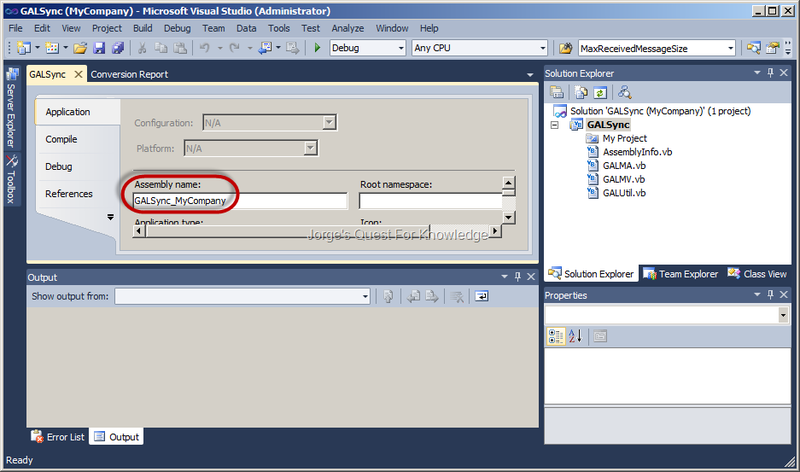 On the left make sure to have selected the TAB called "Application" and then enter the new assembly name being "GALSync_MyCompany". Save and close, but do not close Visual Studio! Now, you want to change the Display Name of synchronized objects in the target AD forests only to include the company name of the source AD forest. In my test environment I only have 2 GAL Sync MAs and one company is called "ADCORP.LAB" and the other is "PARTNER.LAN". This means that every source object being synchronized such as users, groups, DLs, contacts should have the company attribute in AD populated with the name of the company. Assuming you want to adjust every source object being synchronized such as users, groups, DLs, contacts, you need to adjust every GAL Sync MA you have created or want to create. 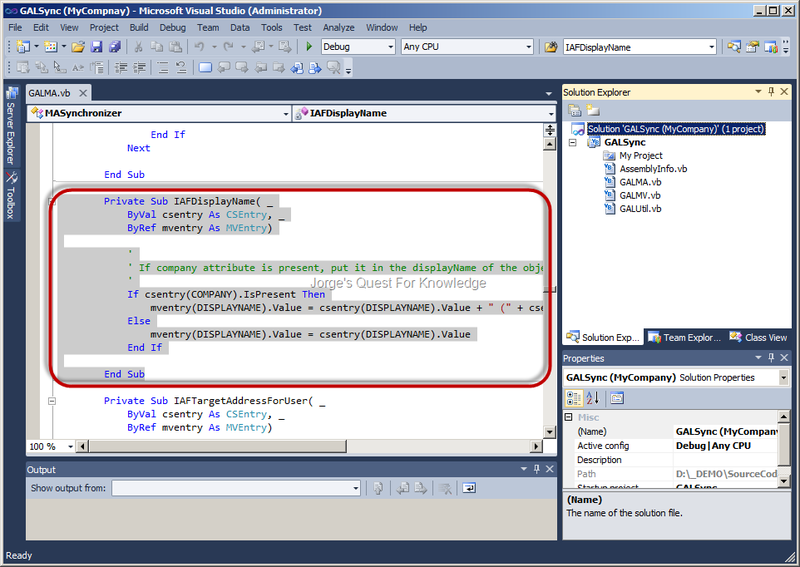 In my environment I had to change the attribute flows in the GAL Sync MA "FOREST_ADCORP.LAB" for the yellow marked objects. 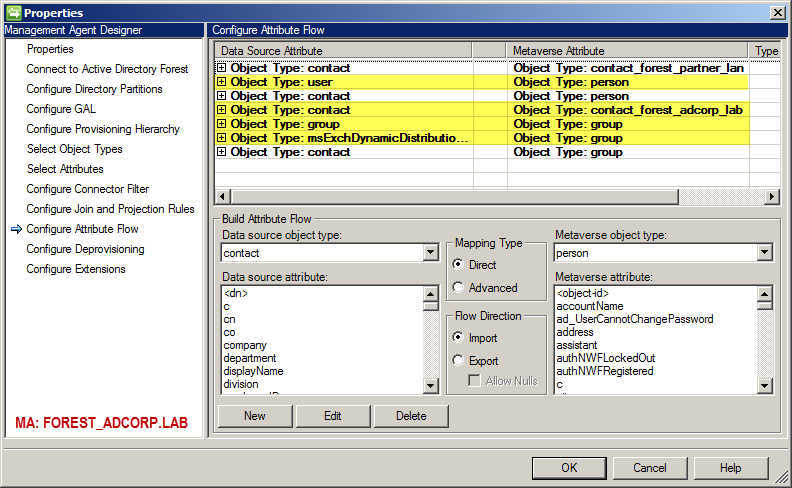 Figure 4: Adjusting The Attribute Flows For Specific Object Mappings For The MA "FOREST_ADCORP.LAB"
I also had to change the attribute flows in the GAL Sync MA "FOREST_PARTNER.LAN" for the yellow marked objects. 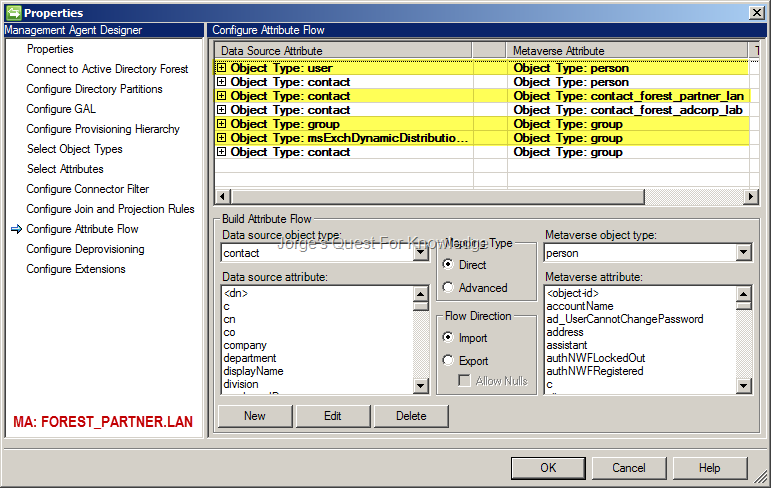 Figure 5: Adjusting The Attribute Flows For Specific Object Mappings For The MA "FOREST_PARTNER.LAN"
Now you are asking yourself. OK, sure, but what is the change then? Hold on, we are getting there! By default the yellow marked objects have an direct inbound attribute flow from "displayName" in the connector space to "displayName" in the metaverse. Because I want to change the Display Name of the source objects in the target AD forests I need to adjust that attribute flow. In this case I’m choosing to do the change in the inbound attribute flow. I could also have achieved the same result while doing it in the outbound attribute flow. By doing it in the inbound attribute flow I will also have the changed Display Name in the metaverse and in that case only the source GAL Sync MA needs to process the transformation while the target GAL Sync MAs just sync the value. 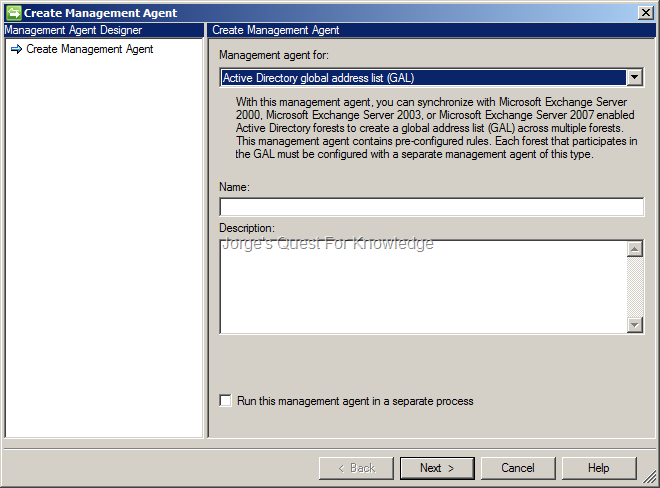 By doing it in the outbound attribute flow every target GAL Sync MA would need to process the transformation. Remember that where you do this also depends on whether or not every target AD forest accepts this or not. 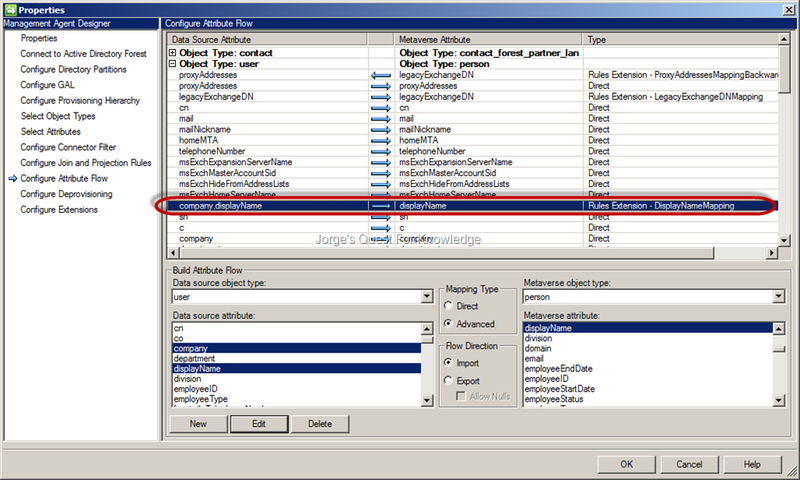 While you have that attribute flow selected, the "displayName" data source attribute will be highlighted. Change the mapping type from direct to advanced, and after that hold down the CTRL key and click on the "company" attribute and then click "Edit". As a Rules Extension FlowRule Name enter (without the quotes) "DisplayNameMapping". Now click OK and you are done, at least for ONE MA. Remember you need to do this for every yellow marked object flow rule (picture 4 and 5) in every GAL Sync MA! Now go back to Visual Studio. 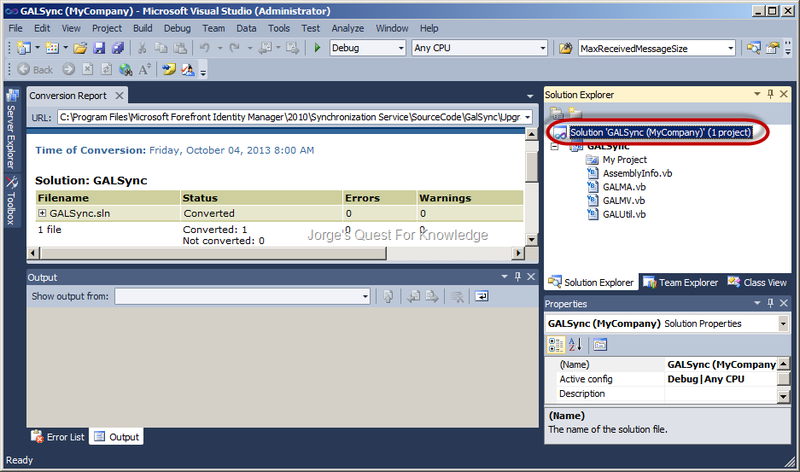 In the solution explorer double-click on "GALUtil.vb". 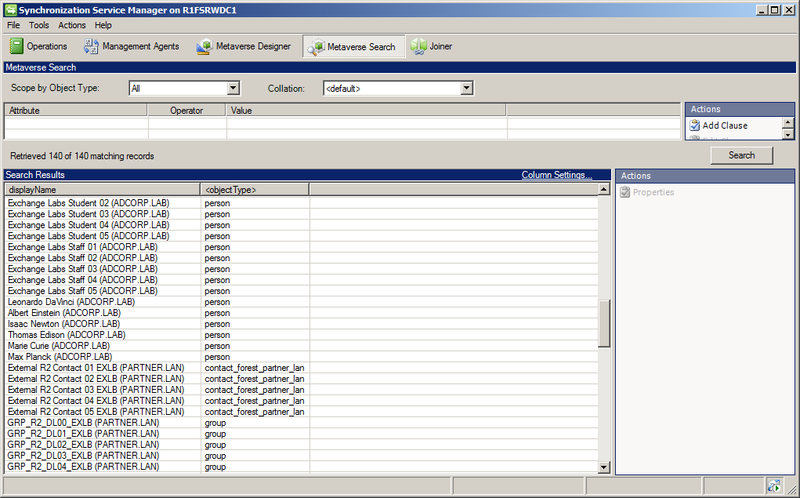 Then search for "’ Object attributes". You will find the section below. Just before the line "Protected ReadOnly PROXY_ADDRESSES As String = "proxyAddresses"" add the extra lines shown below. Protected ReadOnly DYNAMICDDL As String = "msExchDynamicDistributionList"
Protected ReadOnly PROXY_ADDRESSES As String = "proxyAddresses"
Protected ReadOnly LEGACY_EXCHANGE_DN As String = "legacyExchangeDn"
Protected ReadOnly TARGET_ADDRESS As String = "targetAddress"
Protected ReadOnly HOME_MDB As String = "homeMDB"
Protected ReadOnly HOME_SERVER_NAME As String = "msExchHomeServerName"
Protected ReadOnly MAIL As String = "mail"
Protected ReadOnly ORGANIZATION As String = "o"
Protected ReadOnly COMMON_NAME As String = "cn"
Protected ReadOnly MAPI_RECIPIENT As String = "MapiRecipient"
In the solution explorer double-click on "GALMA.vb". Then search for "MapAttributesForImport". You will find the section below. Just after the line "Select Case FlowRuleName" and before the line "Case "TargetAddressMapping"" add the extra lines shown below. Figure 8: Adding A New Mapping For The Display Name In The Section "MapAttributesForImport"
Now search for "Private Sub IAFTargetAddressForUser". You will find the section below. Just before the line "Private Sub IAFTargetAddressForUser" add the extra lines shown below. This is just a location I chose. 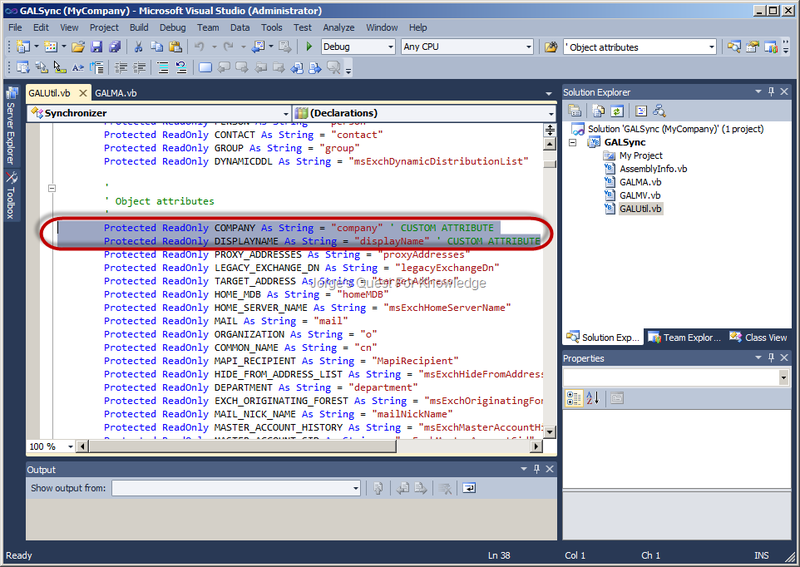 mventry(DISPLAYNAME).Value = csentry(DISPLAYNAME).Value + " (" + csentry(COMPANY).Value + ")"
Now in the solution explorer, right-click the solution and select "Build Solution"
Figure 14: The Contents Of The DisplayName For Synchronized (Received) Contact Objects In The Target AD Forest "ADCORP.LAB"
Figure 15: The Contents Of The DisplayName For Synchronized (Received) Contact Objects In The Target AD Forest "PARTNER.LAN"
This is just an example of how you can change the source code for the GAL Sync solution. Of course there are all kinds of scenarios for which you may want to change the default code.